With a super chic look, navy blue black hair has been attaching the interest of women all over the world. In this post, Layla will get you covered with the most outstanding ways to rock blue black! If you are aiming for a cool and sultry hairstyle, blue black hair cannot be a better choice. This super chic hairstyle is great to present at both office and party. Generally, it is a dark, almost black color but has a blue tone, which leaves your hair with exceptional depth and shine. Its alluring attraction appeals not only normal people but also well-known celebrities such as Katy Perry and Rihanna. We are going to go over the top must-try navy blue black ideas to help you determine the exact style that you are looking for. First of all, we need to mention the bob hairstyle. 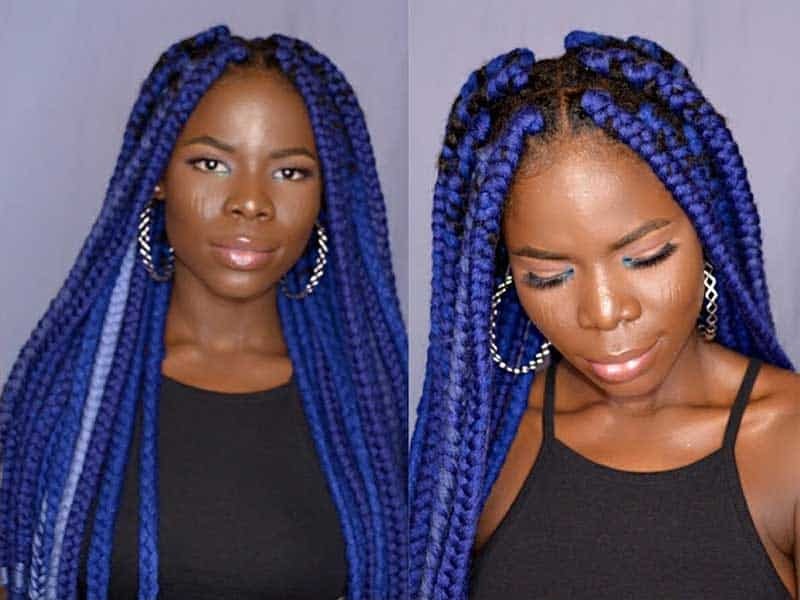 This trendy blue black hair could quickly steal people’s hearts. 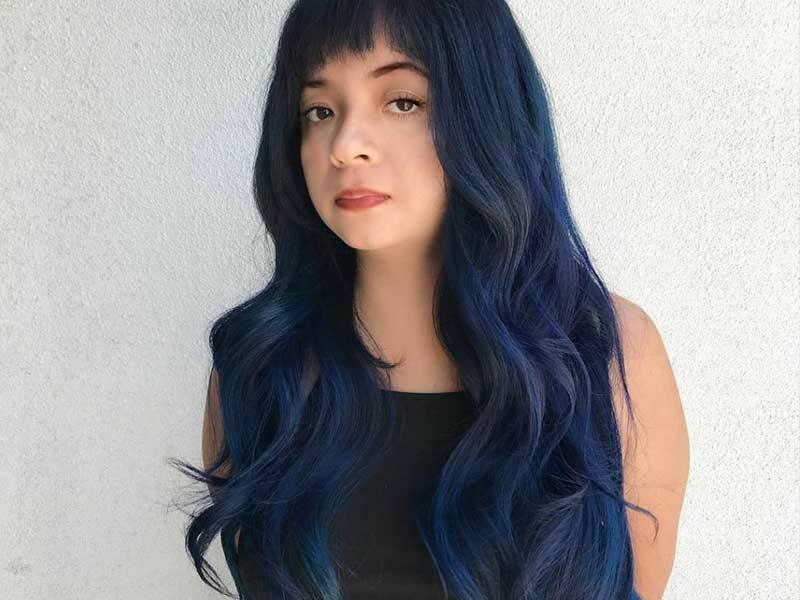 The blue color used in this hairstyle is super dark, making it look almost like the black color. Especially, with a navy tone, this gorgeous hairdo can fit everyone. 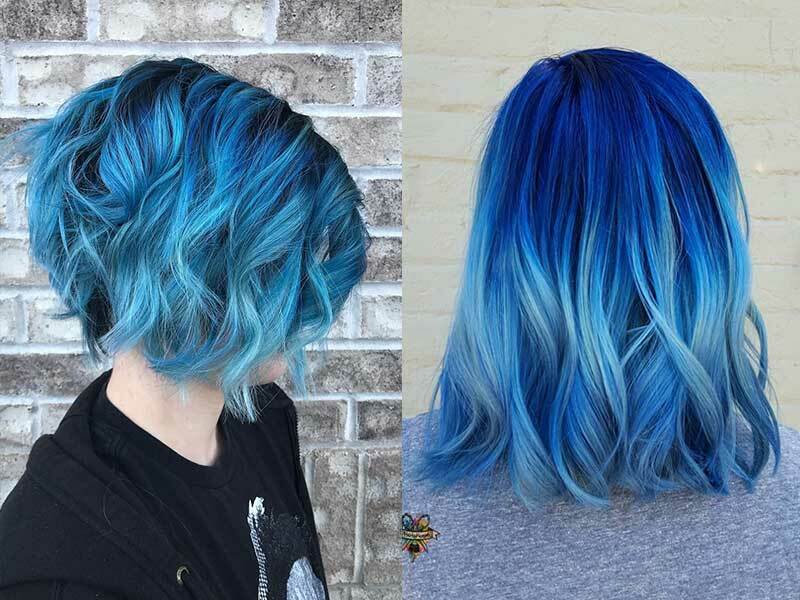 This blue piece is fantastic in every bob hairstyle, from the short bob with bang, short layered bob, inverted bob, to medium and long bob. Are you seeking a glam hairstyle? Then this ombre hair is for you. 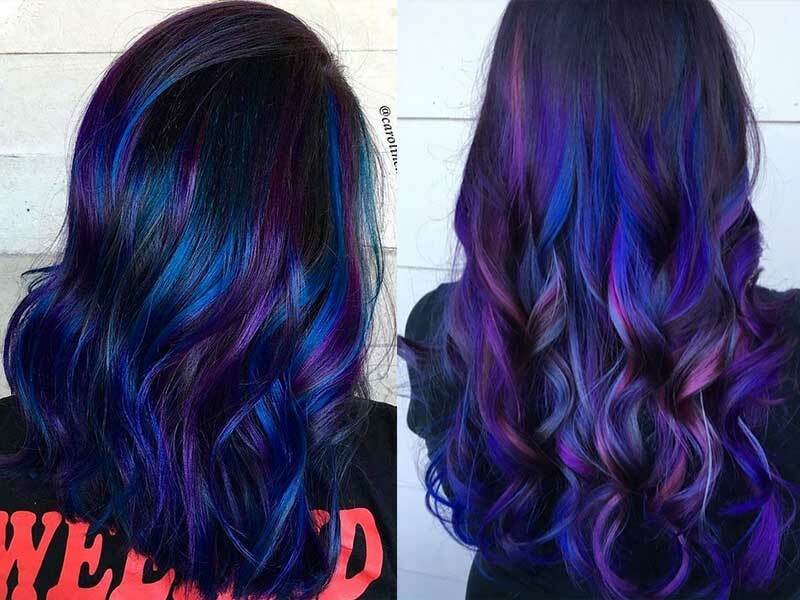 Black to navy blue ombre hair recalls the fantasy creatures like fairies and mermaids, thus being all the rage with youngsters worldwide. 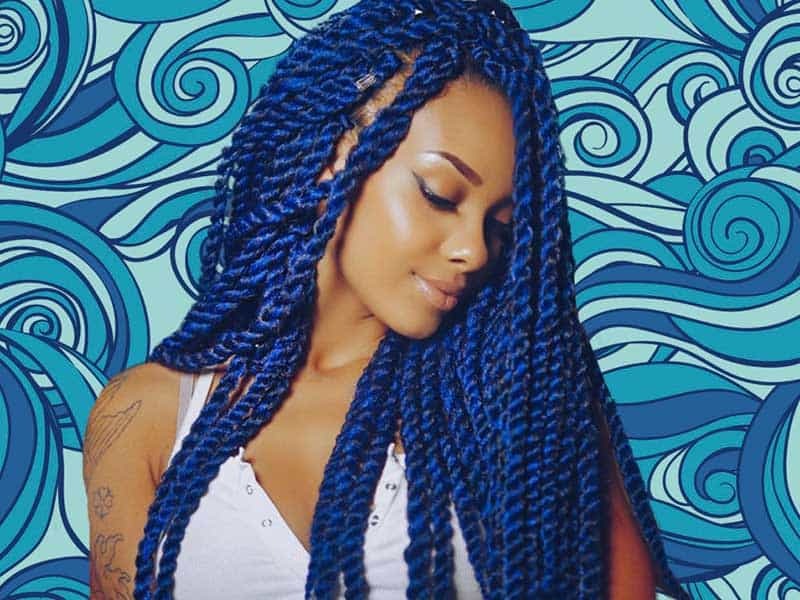 You can go for the ombre color from the roots to the ends or just have all of your hair one blue ombre shades. Another powerful navy blue black looks that we would highly recommend. This hair features a trendy shaggy bob that has both light blue and blue black tones, with grey shades also. Consequently, the combination of different colors has offered this style an extraordinarily stylish look. Navy blue black color can fit long hair well, also. Some thin peek-a-boo navy blue black highlights will add more texture and fantasy to your curly hair. Let the navy blue be a hidden surprise, or let it shine brightly by tussling the hair up. Both ideas are incredible to try. What about adding some more attitude to your casual hair waves? 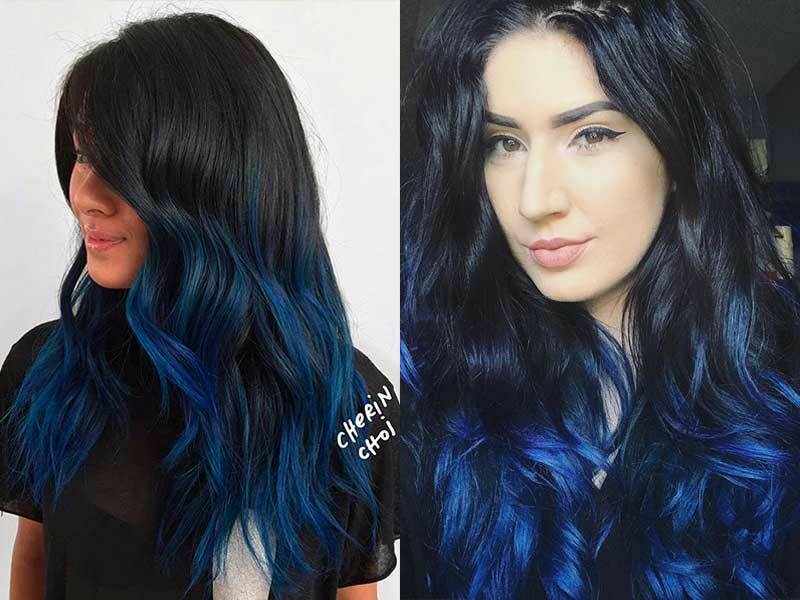 The blue black color with navy tones will easily highlight the curls and make you outstanding among the crowd. 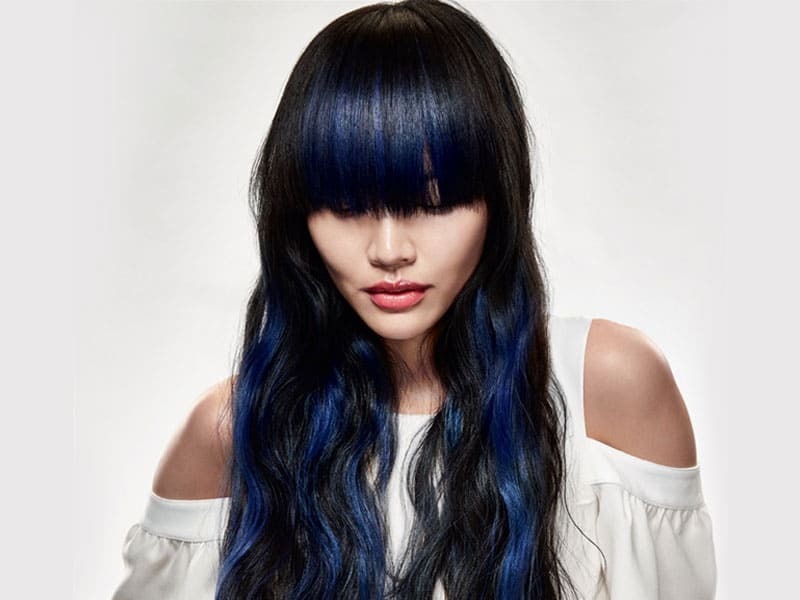 Compared to the black blue ombre, this hairdo provides a less obvious transition from black to navy blue color. Even though it is quite subtle a color change, it is still blue enough for people to notice. 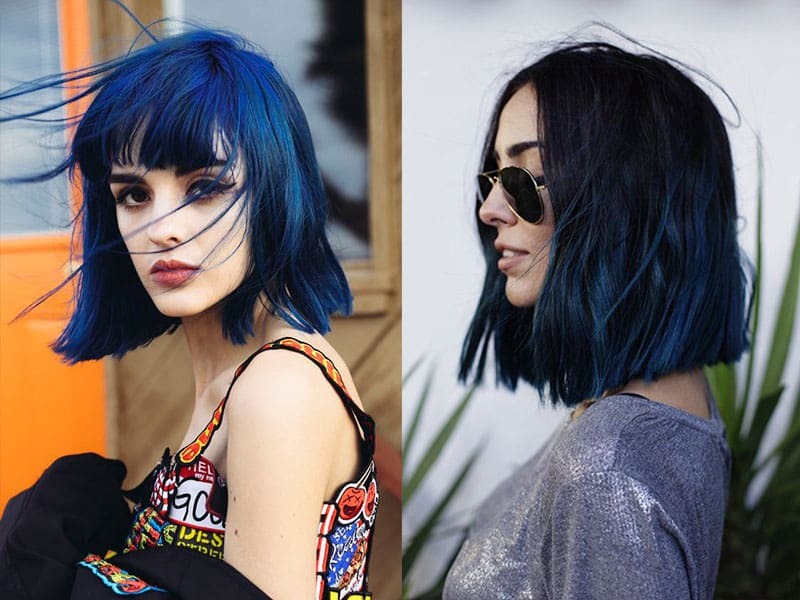 Hence, it is a perfect option for girls who want a stylish yet not-so-outstanding navy blue hair. It offers a bolder look with more blue. 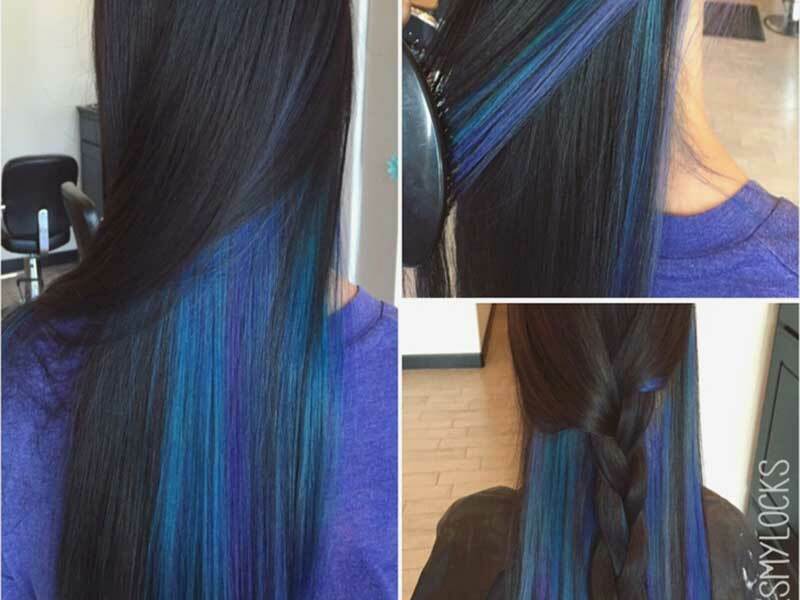 This hairdo is also a type of blue black hair, but the blue really shines. The navy blue looks rather dark under the lower light and turns brighter when the light is stronger. Super rich and classy. It is our favorite choice, as it is bold and edgy, yet not looking so vibrant under the light. While most of the navy blue black offer a chic and classy appearance, the braids help little girls in giving a softer and sweeter look. We call it the “Black Swan” navy blue because it recalls a “shy” feeling. It is the number 01 choice for girls who want to get unnatural shades but still look proper in the workplace. 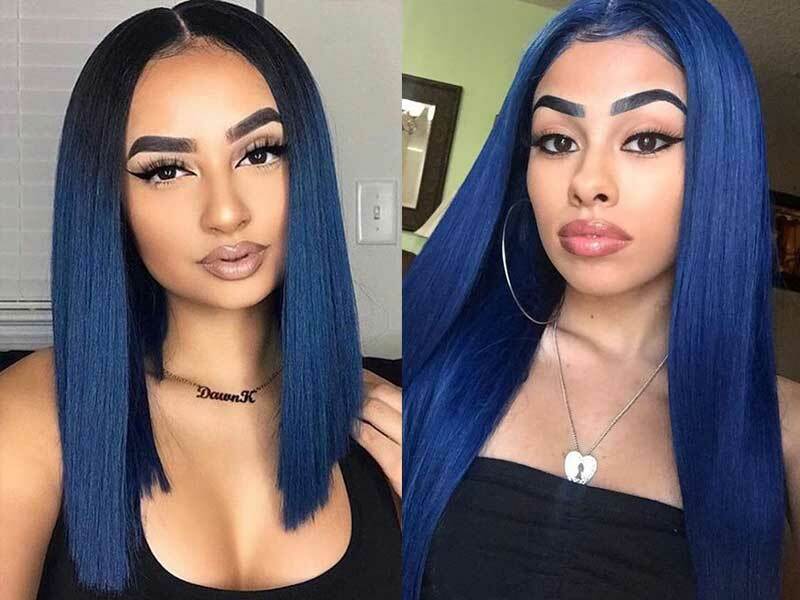 This navy blue and black hair offers a very fierce image for strong women. The hair is straight, but it looks nothing like an everyday old-fashioned style at all. Its edgy and shining look can turn any head! Next, you will be obsessed with the depth and dimension that the soft wavy bob gives. The wavy hair with blue and black color looks gorgeous and mysterious as nightfall. The midnight blue stands out when the light hits the medium layers of the hair. While navy blue black hair color has already been vivid and vibrant enough, purple would make you even more outstanding. The delicate blend of different colors would compliment the dark excellently. A light purple is also considerable, too. A super stylish hairdo to try. While the simple braid style (mentioned at #8) offers a soft image, the box braid sound to be stronger and edgier. Make yourself one of a kind with this unique look! With this style, the hair looks deep black in the roots and gradually transitions to the trendy navy blue black. Layered or asymmetrical lobs will be good bets for this style. This little hint of color in your black hair remains a secret when your hair is tumbling. However, once going for updo styles like ponytails, it would add bright to your hair. Braiding is not bad an idea, by the way. Navy blue black can either be vivid, vibrant, subtle or sultry. No matter what style you are looking for to have a chic and cool look, this color can never go wrong. If you find dying your hair navy blue black a challenging task, you can try the hair extensions and wigs instead. It’s affordable and easy to use. 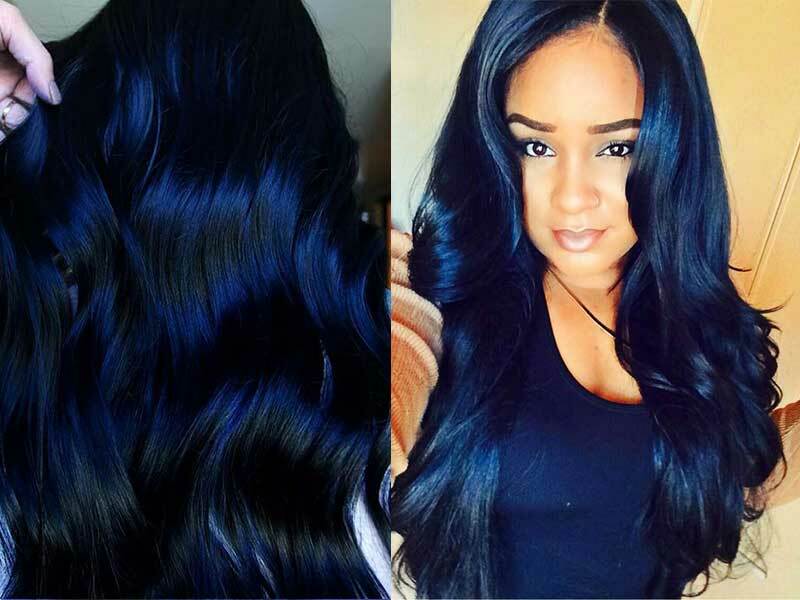 Check out Layla Hair’s website to get updated on the hottest navy blue black hair extensions! A long list of Vietnamese and Cambodian – rooted virgin hair awaits!